New addition before spray foam application. 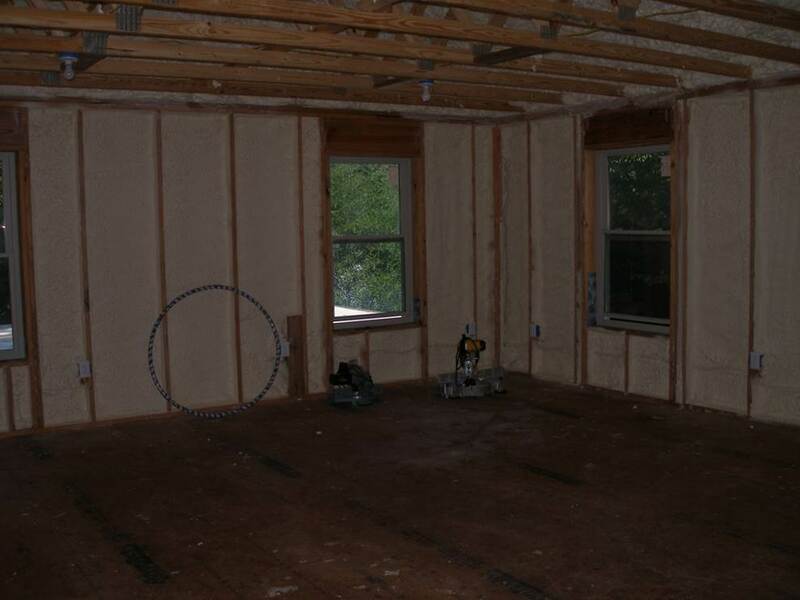 Note 2 x 6 inch walls for energy efficiency. 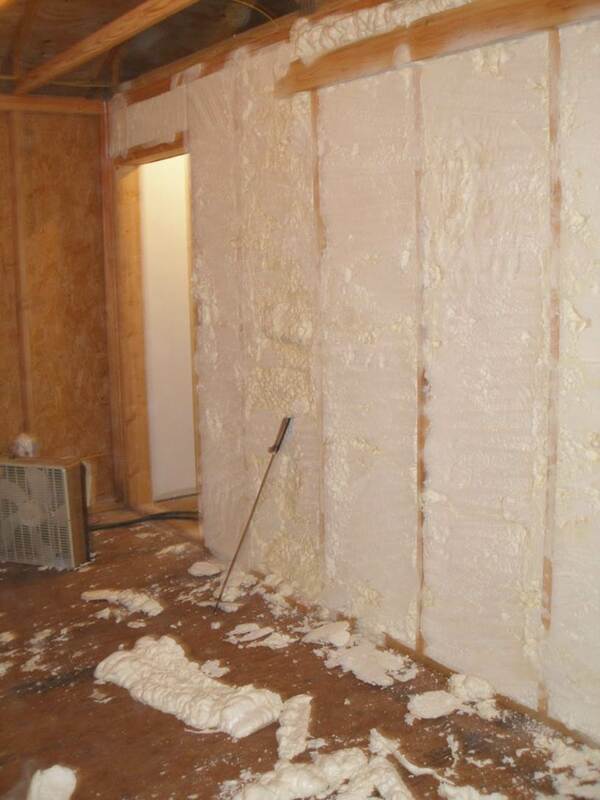 Same wall after spray foam installation. Addition roof deck before spray foam. Spray foam placed behind outlets first to prevent them from pushing out during main application. 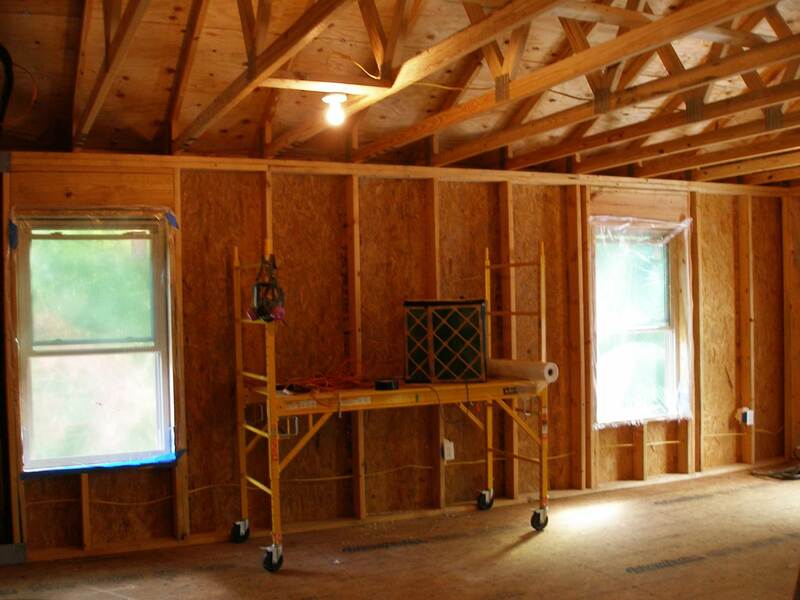 Note open framing at corners to allow for insulation. Masking off windows to protect them from overspray. Note raised heel trusses and 2 ft on center framing for energy efficiency. Setting fans to exhaust air from work area to help improve air quality after application. 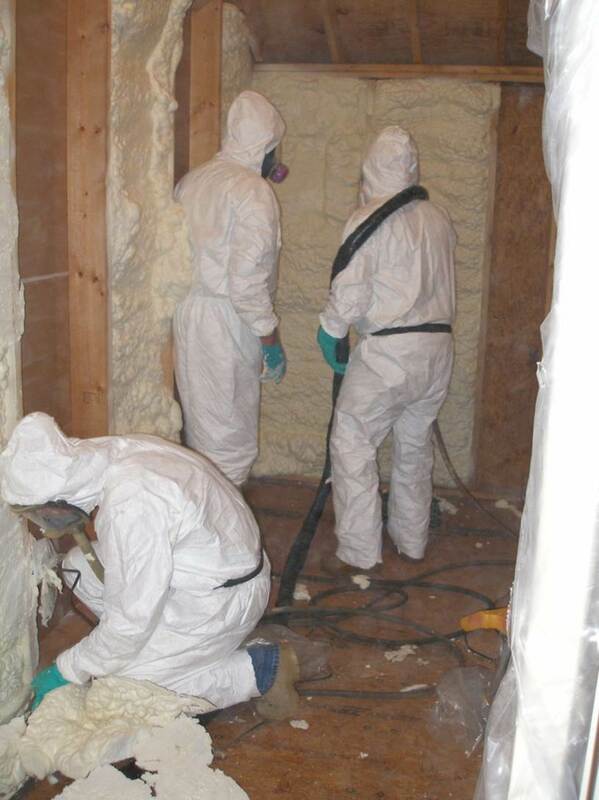 Workers applying open cell foam in wall cavities, then trimming flush with face of studs. Same area after spraying complete but before being trimmed. Same small utility area after completion and cleanup. This is where addition connects to existing home and old siding has not yet been removed where exterior wall has now become an interior wall. Workers starting to apply open cell foam to underside of roof deck. Walls at stairwell after being trimmed. 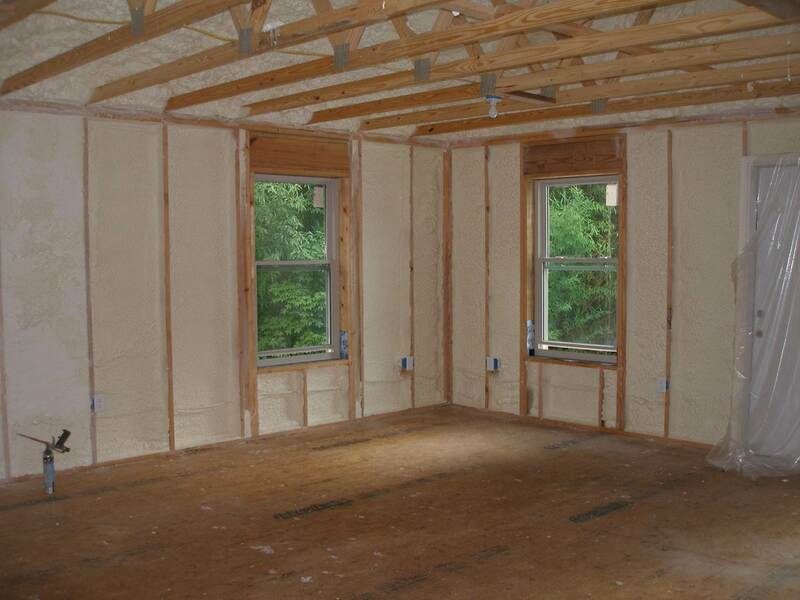 Open cell foam was used here for sound deadening. Starting to spray roof cavity. 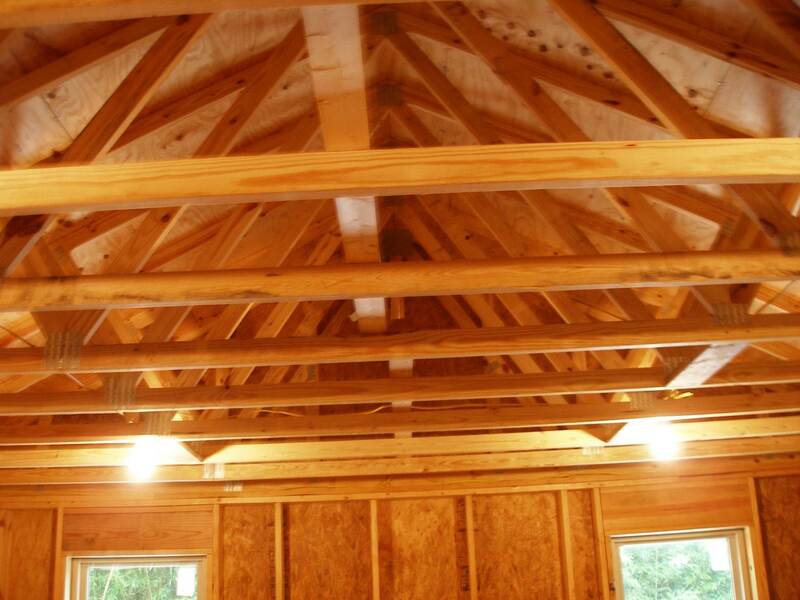 Note that foam is allowed to extend over face of trusses so that thermal bridging does not occur. A few seconds later during application the foam has started to rise. 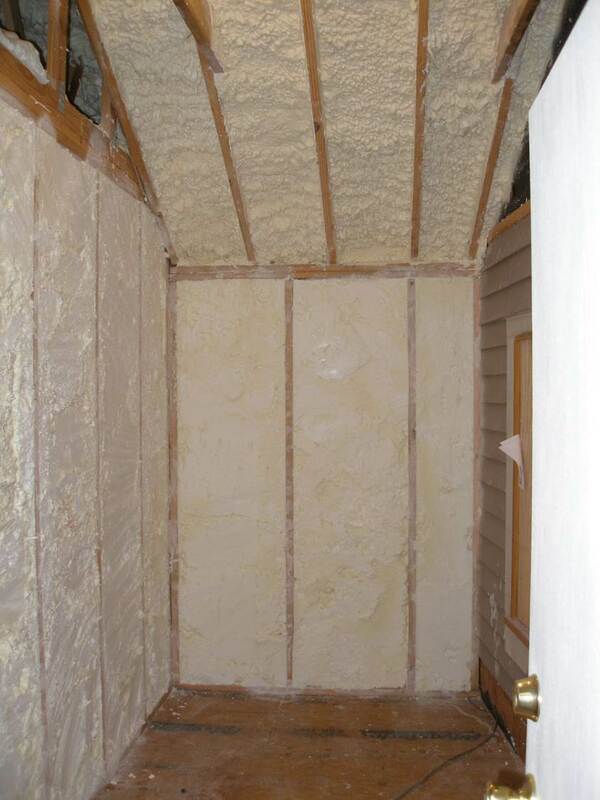 Foam is also extended into soffit area, which has been constructed without ventilation. 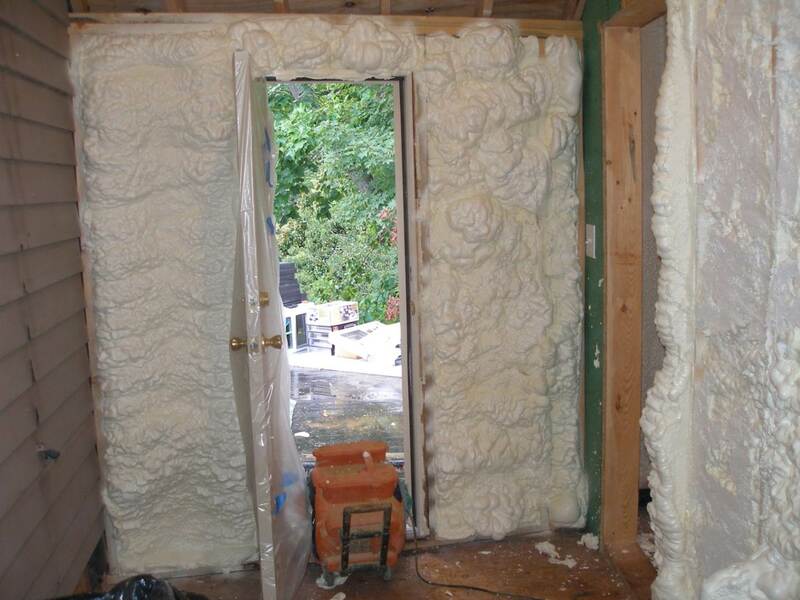 Open cell foam in exterior wall before being trimmed. 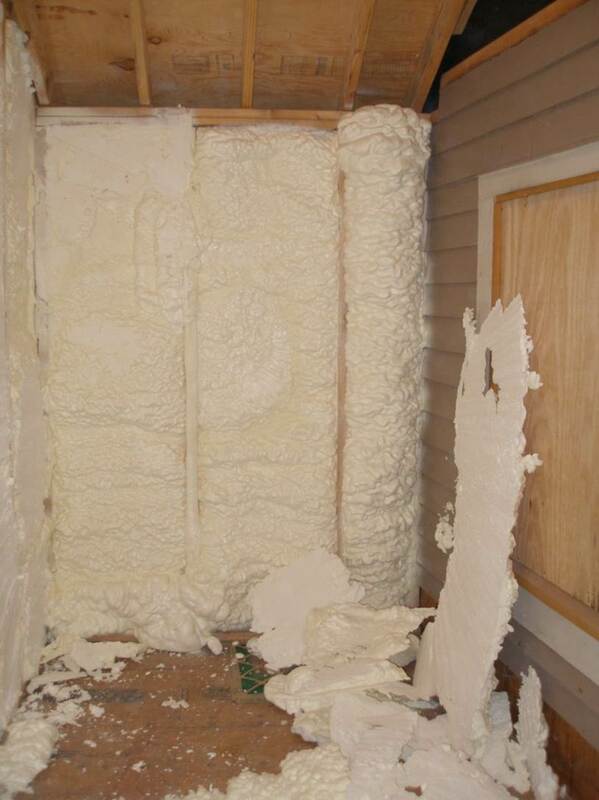 Open cell foam in same wall after trimming and cleanup. 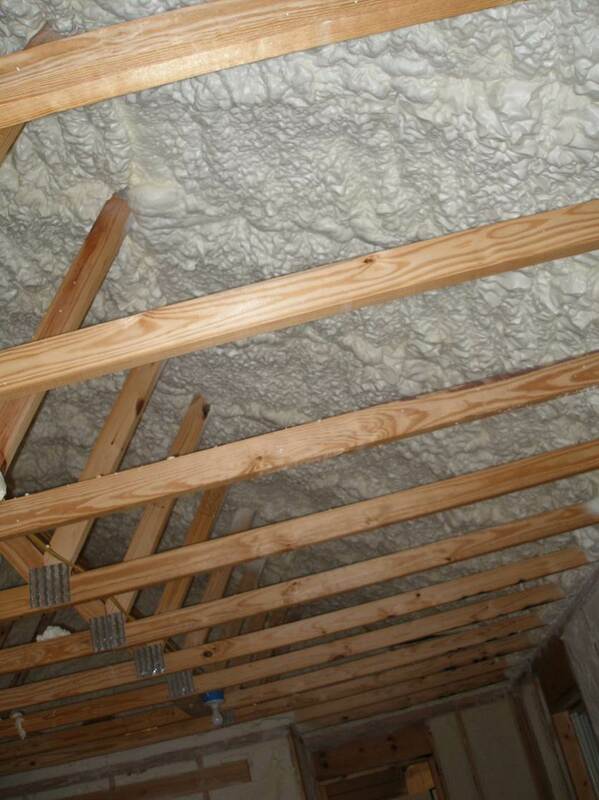 Closed cell foam has been installed in roof cavities. Room after installation complete. 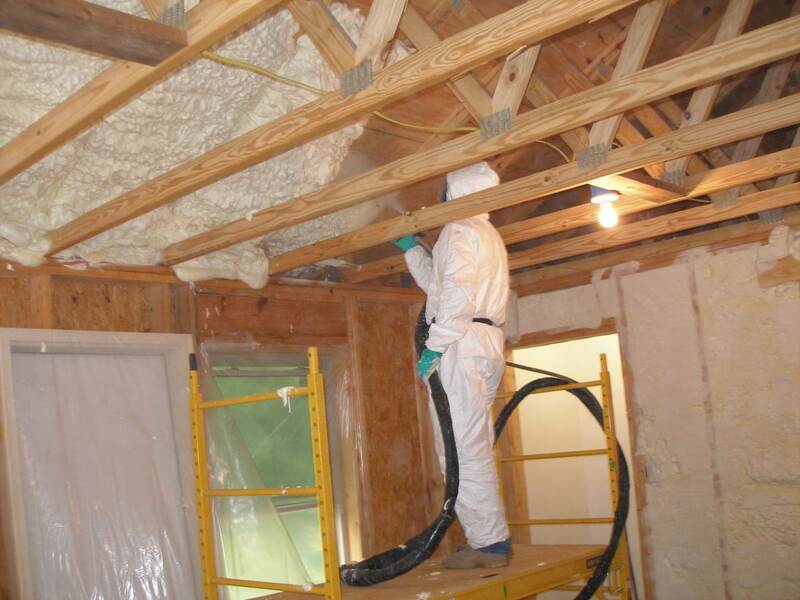 Open cell foam in roof cavities, closed cell foam in exterior wall cavities. View of finished roof area with open cell foam. View of finished roof area with closed cell foam. Note the absence of a ridge vent. The attic areas will be unvented and a small amount of conditioned air from the HVAC system will be supplied instead, to keep the humidity levels low and the space dry and clean. 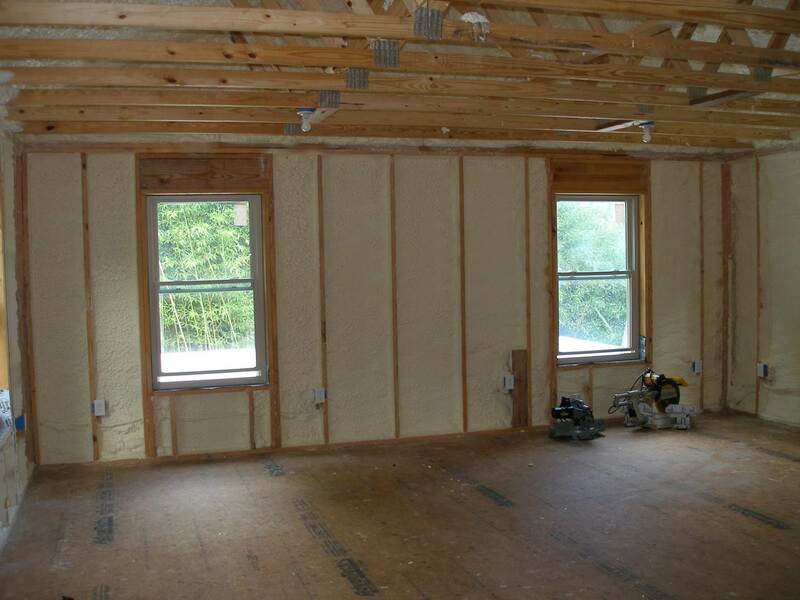 Insulate Addition With Spray Foam Project, Summer 2016. Knoxville,TN. $4.5K. 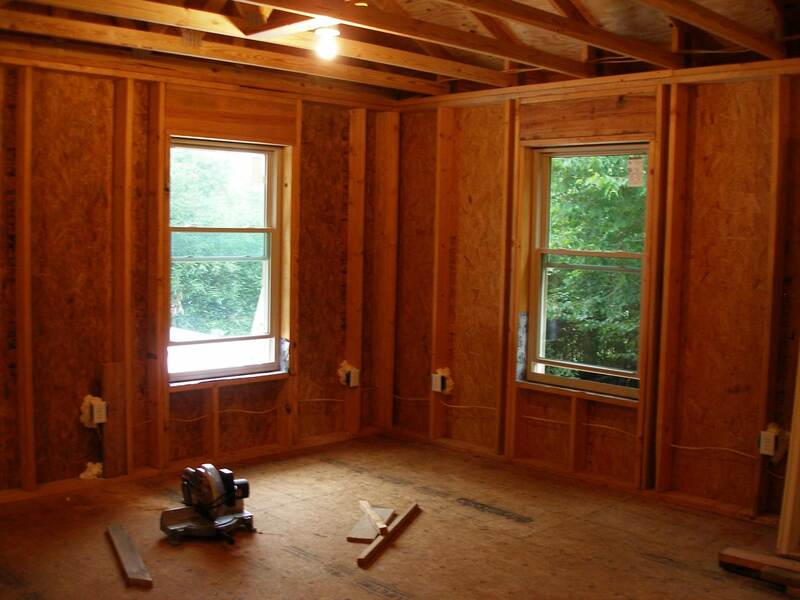 This customer had built a 740 sf addition to their home, using advanced framing techniques and installing energy-efficient windows and doors. 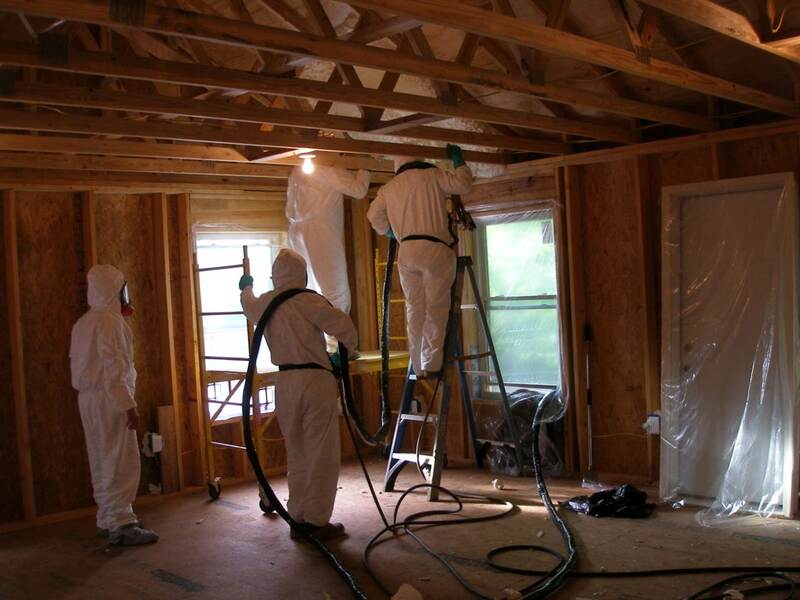 Their goal was to make the addition as energy efficient as possible by also installing spray foam insulation. 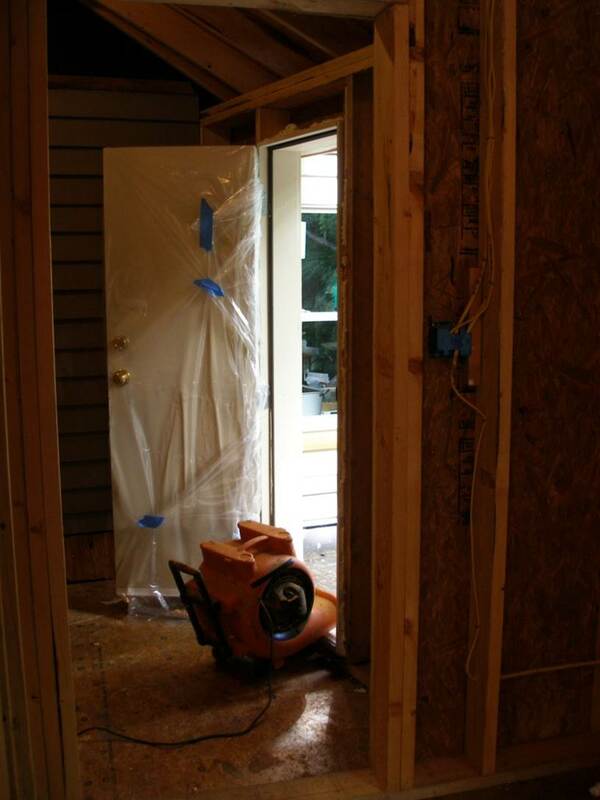 First, the area was prepared by masking off doors and windows to protect them from overspray. 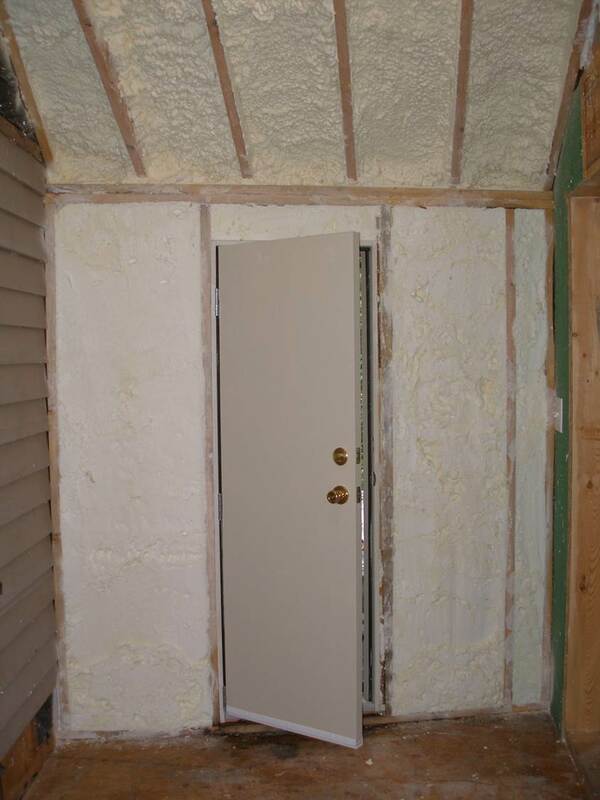 Then, 2 inches of closed cell spray foam was applied to the wall cavities, to achieve R-14. 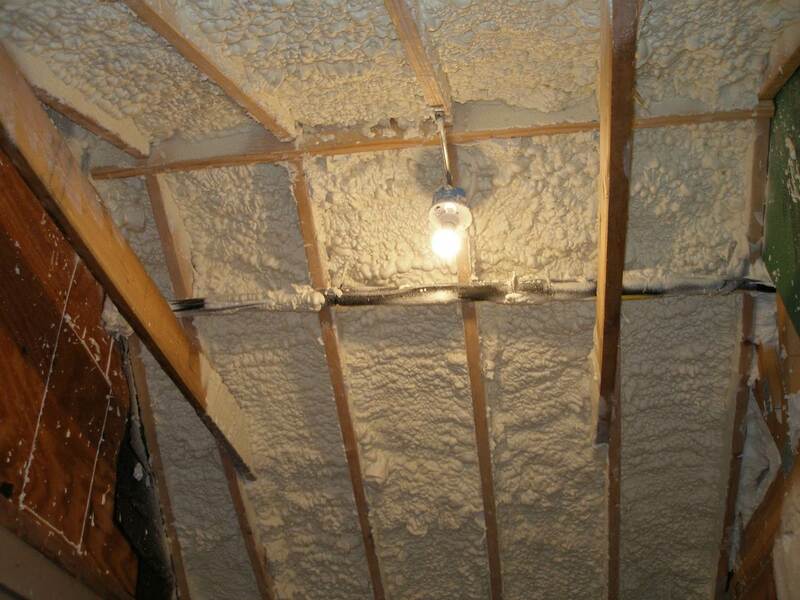 This was followed by installing 6 inches of open cell foam in the roof cavities, to achieve R-22. 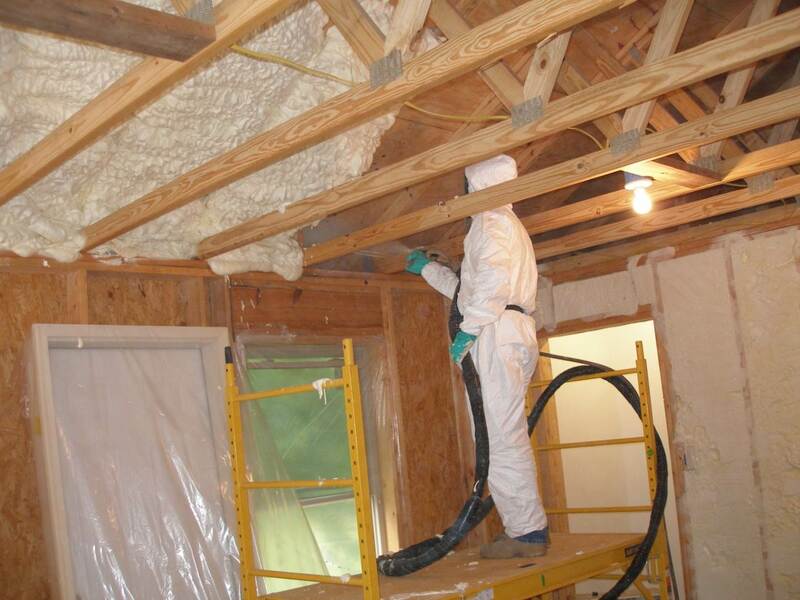 Due to the air sealing qualities of spray foam, the true insulating value of these materials is somewhat better than these ‘prescriptive’ R-values, which were established for more traditional insulation materials such as fiberglass and cellulose. 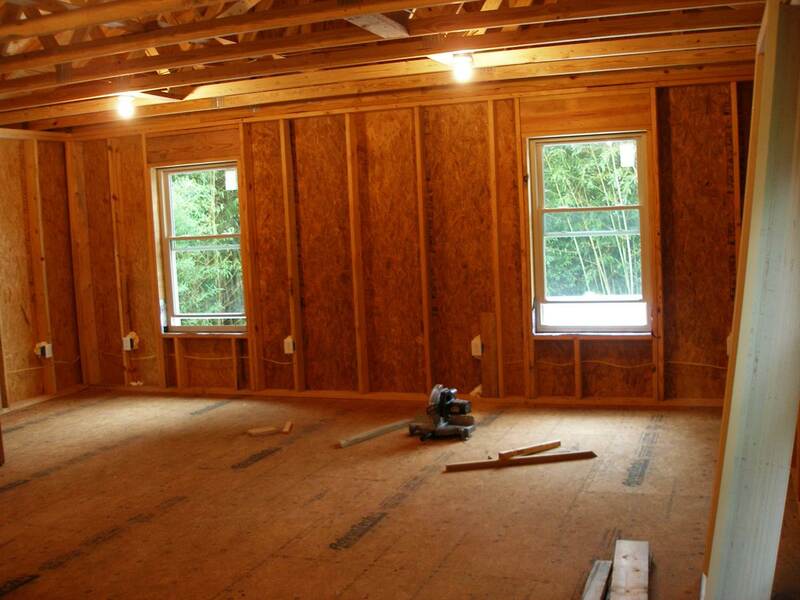 This addition will be very comfortable and easy to heat and cool during every season as a result.